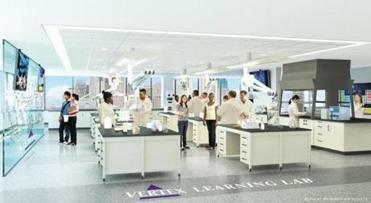 Students from Green Academy will be learning at the Vertex Pharmaceuticals lab. Vertex Pharmaceuticals Inc. says it is creating the lab of the future in Boston’s Seaport District, yet its most innovative feature won’t be touch-screen monitors or high-powered microscopes. It is that the lab is being built for Boston’s public high school students. The laboratory, scheduled to open by early 2014, is the result of a novel $1.45 million partnership between the city and the drug maker, which is moving its headquarters from Cambridge to two towers under construction in Boston’s waterfront Innovation District. 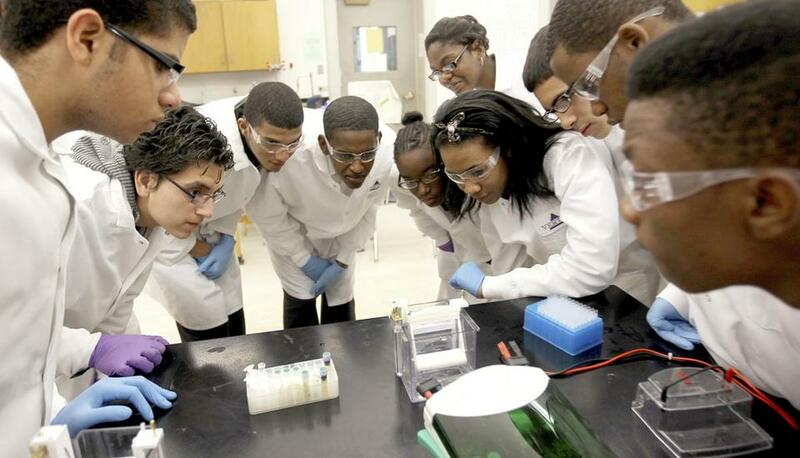 The goal is to improve science education by allowing students to work with scientists. Mayor Thomas M. Menino and Vertex executives will unveil plans for the partnership Monday as part of the city’s efforts to put a spotlight on its commitment to life sciences as more than 15,000 attendees from around the world gather in Boston for the Biotechnology Industry Organization’s annual BIO convention. Vertex executives will also reveal that they have signed a lease to open a 98,000-square-foot manufacturing plant on the waterfront. That facility, at 1 Harbor St. in Marine Industrial Park, will handle small-scale manufacturing for clinical trials as well as shipping and receiving activities, a Vertex spokesman said. The plant will be in addition to the two Vertex towers, which are being built at Fan Pier, the 23-acre development next to the federal courthouse. Overall, Vertex is investing more than $800 million in its new campus, which will house more than 1,400 employees and is scheduled to open in 2014. Along with providing the student lab, Vertex will work with two South Boston high schools to provide supplemental workshops and classes, summer internships at the company, and a four-year college scholarship to be awarded annually. So far, Vertex has agreed to fund the collaboration for three years, but company executives said they hope to make it permanent. “We want to move the bar in science education and make a difference in the lives of these students,” said Bryan Vought, a senior research scientist at Vertex. The learning laboratory will be open to community groups and all public high school students, while the internships and other academic programs will focus on students and teachers from Boston Green Academy and Excel High School, both in South Boston. 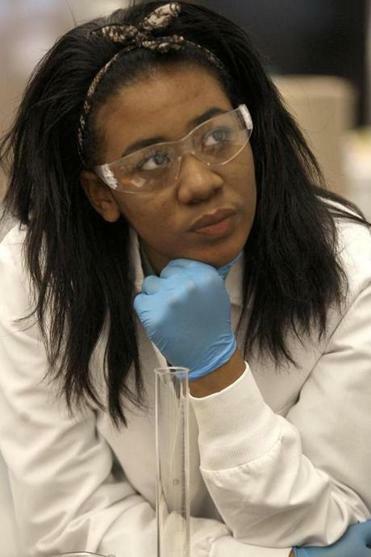 Vertex executives said they chose the South Boston schools to help close the achievement gap between city students and their suburban counterparts, who tend to score better on statewide tests. In a lab on the ninth floor of a tower along Northern Avenue, students will be able to perform experiments against a backdrop of the city’s high-rises. The 3,000-square-foot facility will feature a large touchscreen that will allow students and scientists to view microscopic images of viruses and use electronic markers to dissect their various parts. Vought said the program will teach students not only how to apply scientific theories, but show them that mastering those theories can lead to rewarding careers. Anteneh Mekonnen, a sophomore at Boston Green Academy, said he intends to pursue a summer internship at Vertex. The program with Vertex also includes summer fellowship programs for teachers as well as additional workshops and mentoring to encourage students to pursue advanced-placement science courses. Mekonnen said right now he is most interested in mechanics and engineering, but he is eager to get a close-up view of a job in biosciences.